Jacqueline by Bugatti received the Red Dot Award: Product Design 2019. The kettle, born from the creativity of Innocenzo Rifino and Lorenzo Ruggieri, has an iconic design. 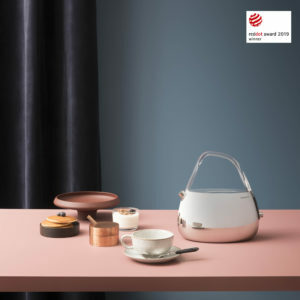 Its shape recalls a bag and is inspired by the traditional ceramic teapot, reinterpreted with a contemporary touch. Combines technology and style: it allows to manage every aspect of the infusion, from the water level to the temperature (which can be regulated with precision from 40° to 100°C), up to the function of keeping warm, used to keep the water at a preset temperature for up to an hour. The Bugatti B Chef app (available for iOS and Android) allows to customize the setting for each day of the week: from the programmed temperatures, to setting the time, to keeping warm etc. “We are very proud of this important award – Clemente Bugatti, CEO of the company, said -. Jacqueline makes the traditional tea ceremony a chic and contemporary experience… warm up your style”. The award ceremony will be held on July 8th. All award-winning products will be exhibited at the “Design on Stage” exhibition at the Red Dot Design Museum Essen. Jacqueline Kettle will also be part of the Red Dot Design Yearbook and will be in the Red Dot Design App.